The Compulsive Reader: Monthly Commenter Contest! This month I have an awesome new release up for grabs here: Fury by Elizabeth Miles. I heard Elizabeth speak back in May and read aloud from Fury, and she was marvelous! I know that is a book that you're not going to want to miss, so I'm giving you lovely readers many chances to win a copy the entire month of August! How to win: Every time you post a significant comment that contributes to the conversation, I give you an entry into the contest! The more you comment, the more you entries you get! Only comments on posts from August 2011 are eligible, so keep coming back for more posts and more chances to comment. For all of the details, click here. 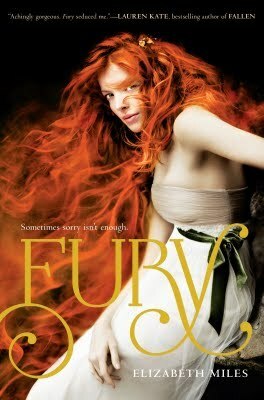 Fury comes out on August 30th, 2011, so if you win, you'll be one of the first people to get it! In Ascension, mistakes can be deadly. And three girls—three beautiful, mysterious girls—are here to choose who will pay." I can't wait to read this book! It sounds so suspenseful, action-packed, and unique. Great contest! This is one of the most gorgeous covers I've seen. I'm very interested in this one. Not only does this book sound good, take a look at this cover!! Any other hair colour wouldn't be nearly so dramatic!! I'd love a chance to read it to see if it lives up the expectations I put on it for having such a dramatic cover! Love the girls hair! Looks like flames.